This is a powerful quote from George Bernard Shaw, and the way of life for the Unreasonable Institute. Now what is the Unreasonable Institute, you might be asking? They are a local, Boulder-based nonprofit whose mission is to support and leverage entrepreneurs as they solve the world’s greatest problems. Since 2009, more than 16 million lives have been impacted by Unreasonable, in areas such as environmental safety, malnutrition, education and poverty. As we progress through school, we are often taught that there is only one “right” answer. And if you spend enough time thinking through the problem, you will get to that single right answer. Let’s be real though, life (and its biggest problems) is never cut-and-dry. There are far too many variables and exceptions to have only one answer. Successful entrepreneurs understand that multiple answers exist, and more importantly, they recognize that their initial answer will likely be wrong. This is not some kind of self-deprecating attitude that entrepreneurs share, but rather a wisdom to understand the importance of feedback. Our first answer is based on our limited understanding of the problem, and this answer is made in isolation from the rest of the world. Feedback helps us understand our oversights and gaps, as well as our strengths. With each round of feedback our answer improves and becomes more complete. This is where the unreasonable man or woman has a leg up. We are trained to be thinkers first – to front-end our time buried in books or in our heads, until we decide on the “right” answer and finally take action. But entrepreneurs can concurrently take action while thinking, and they are not afraid to fail a few times until they get to their answer. 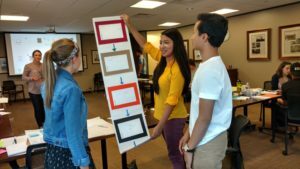 Boettcher Scholars learned about one of the entrepreneur’s most powerful tools for getting feedback: rapid prototyping. Entrepreneurs rarely have enough time, resources, or money on hand (sounds a lot like a college student right? ), but they must create a product regardless. So they go through fast and successive trials, tinkering and fine-tuning their product after each round. The first few prototypes might be failures, but they quickly learn why, and they do so with relatively little cost of time and money. Take Zappos for example – they are a highly successful retailer today, but when they started they didn’t know whether an online shoe store would be feasible, so they didn’t purchase any of their own inventory. But how do you start a shoe business without any shoes? When a customer ordered the shoes on their website, they went to the shoe store down the road, bought those shoes, packaged them up, and then delivered them to the customer. After a while, they realized that people would actually buy shoes online before trying them…and the rest is history. Rapid prototyping helped them cheaply and quickly test the feasibility of their business first without the need for heavy investment. Thinking through all the details would not have been nearly as fast or effective as the approach Zappos took. Our Boettcher Scholars practiced these same approaches during the recent weekend workshop, looking to tackle the problems of food waste, career exploration and debt reduction. The scholars went to the streets, called up friends and leveraged each other to get feedback on their initial solutions, and had successfully made multiple revisions to their approach. In a half-day, they created mock “phone apps” using construction paper, tested their business strategies with prospective clients and spoke with actual businesses to see if their analytical tool would meet their clients’ needs. They were amazed by how quickly they went from nothing earlier that day to testable products a few short hours later. If we give them a few months, who knows what they could accomplish! 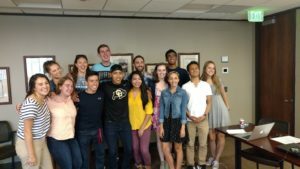 Whether or not this group goes on to become entrepreneurs in the future, they walked away with some great new entrepreneurial techniques to apply in their everyday lives. These lessons – like the willingness to fail and to take action while still having unanswered questions – could go far with the entire Boettcher community. A community who has impressive skill and aptitude that can change the world, but because of that same skill and aptitude, has also been conditioned to believe they need to excel in everything they do and always have the “right” answer. That pressure to succeed is a double-edged sword that can create artificial barriers to making large-scale and highly impactful change. Don’t let that hold you back though. Harness your inner-entrepreneur and remember that we will likely be wrong the first time around; but by going out there and trying anyway, we can learn a great deal more than we ever could by waiting until that elusive “right” answer appears. A great big thanks goes out to Banks Benitez, and to the Unreasonable Institute, for their time and genius this past weekend. Keep up the amazing work! For more information about the Unreasonable Institute, check out their website at https://unreasonableinstitute.org/.